To my surprise, the Japanese people I spoke with seemed shy about calling it what I thought it was: a war crime and a crime against humanity. Their dignified stoicism in honoring the victims of the bombing and standing as a beacon against evil ("No More Hiroshimas") was moving. The Japanese people I met bore no ill will against the United States, and one person even reminded me that Japan attacked Pearl Harbor. You know you are in Japan when you look out the window of a Shinkansen bullet train traveling at 285 miles an hour. The ride is smooth. The engine car of a Shinkansen is a thing of beauty: the nose is a marvel of aerodynamics reducing drag and looks like the head of a snake – it is gorgeous in a non-threatening way. The seats are luxurious by American standards, and the train is wheelchair accessible. The bathrooms are huge and accommodate wheelchair users comfortably. There’s an LCD screen with constant flowing information in Japanese characters with an occasional English sentence. You know you are in Japan when the food cart pusher on a Shinkansen bullet train from Tokyo to Hiroshima bows to the passengers before exiting the car. It’s a gesture of respect for the passengers, and it is such a lovely thing to behold. It is quintessential Japanese. You know you are in Japan when the subway crew puts down a ramp for wheelchair users and calls ahead to the destination station so when the train arrives there, the crew is ready with a ramp. 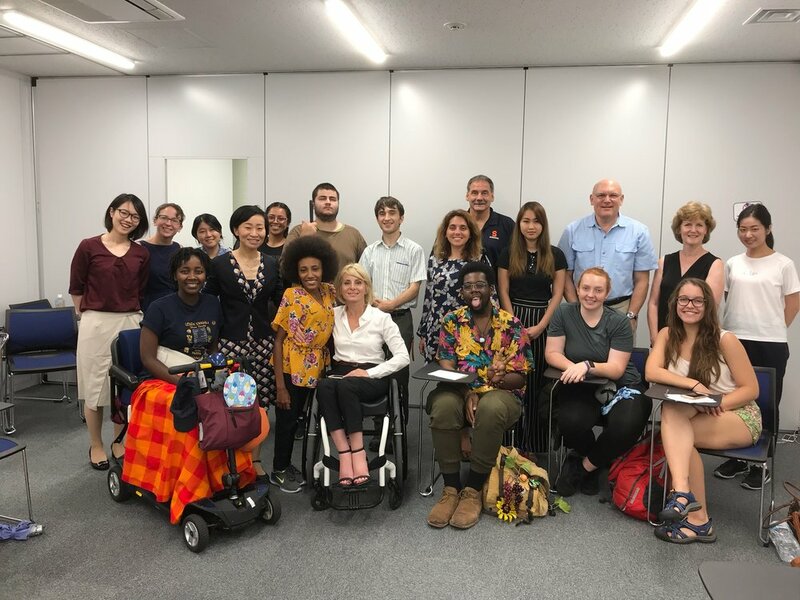 Intercity travel (Tokyo to Hiroshima to Kyoto to Tokyo) and using subway trains and trams in each city gave us on-the-ground exposure to how accessible the train system in Japan is. You know you are in Japan when you can set your watch to the schedule of the subway trains. When a train announcement states that a train will be arriving at 9:07, you can be sure the train arrives at 9:07. You know you are in Japan when you’re starving for a slab of Kobe beef and learn it’s outrageously expensive at $55 an ounce. Kobe beef is legendary for its marbling – cows are given beer to stimulate their appetite, and they’re massaged daily. You know you are in Japan when a typhoon hits in late afternoon with dark wind-whipped clouds and driving rain. Typhoon Shanshan hit Tokyo the last night of our trip, and put on quite a show. Japan is an awesome country.